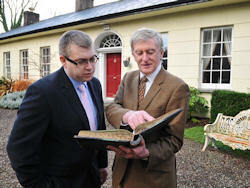 Irish Distillers Pernod Ricard today announced that Barry Crockett, Master Distiller of Jameson Irish Whiskey, will retire this March, bidding a fond farewell to the Midleton Distillery in Cork after 47 years; 31 of which he spent as Master Distiller. The announcement comes, fittingly, in the week in which Crockett was honoured by Whisky Advocate with its Lifetime Achievement award*. 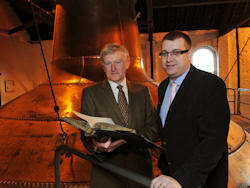 Brian Nation, who has been mentored by Barry Crockett for the last ten years, will take over the role of Master Distiller. Born in the Distiller’s cottage that sits on the grounds of the Old Midleton Distillery, Barry Crockett has been immersed in the craft of whiskey distilling for almost 50 years. At the age of seventeen, Barry began learning his craft as a young apprentice to his father and Midleton Master Distiller, Max Crockett, eventually succeeding him as Master Distiller in 1981. During his time as Master Distiller, Barry has seen the success of Irish whiskey, and in particular Jameson, grow on an unprecedented scale. In 1984, Barry developed the award-winning flagship blend from the Distillery, Midleton Very Rare, and in 2011 oversaw the launch of the Single Pot Still Whiskeys of Midleton. Launched to rejuvenate the popular style of whiskey to its former glory, the pinnacle of the range, Midleton Barry Crockett Legacy, marks the first time since John Jameson that an Irish Distillers product has been named after a Master Distiller. Peter Morehead, Irish Distillers Production Director, commented: “The Crockett family has dominated Irish distilling for more than 70 years, so Barry’s retirement truly marks the end of an era. We are really going to miss Barry - his passion for quality and his kind, gracious nature set him apart from the rest, as do his outstanding achievements. The success of Jameson, Midleton and the great whiskey brands it produces has not been a surprise to the people who know Barry and his high standards of excellence, so we are immensely grateful for everything he has done for Irish Distillers and of course the Irish Whiskey category. We wish him all the very best in his retirement." To mark Barry’s retirement, he will be honoured with an intimate dinner party on 3rd September 2013 at ‘The Housewarming’ – a special event that will be held in Midleton to officially launch the new expansion amongst other things. Many of the close friends Barry has made during his time at Irish Distillers are expected to attend, where he will be presented with a special gift from his peers.